Richard Medeiros shows how it's done at the celebration party for the newly renovated skate park. One-and-a-half year old Wren may not be the best skateboarder on the Island, but not for lack of trying. According to her father Nick Briggs, she’s reached pro-level in the sit-down-and-scoot style, known to the masters as buttboarding. 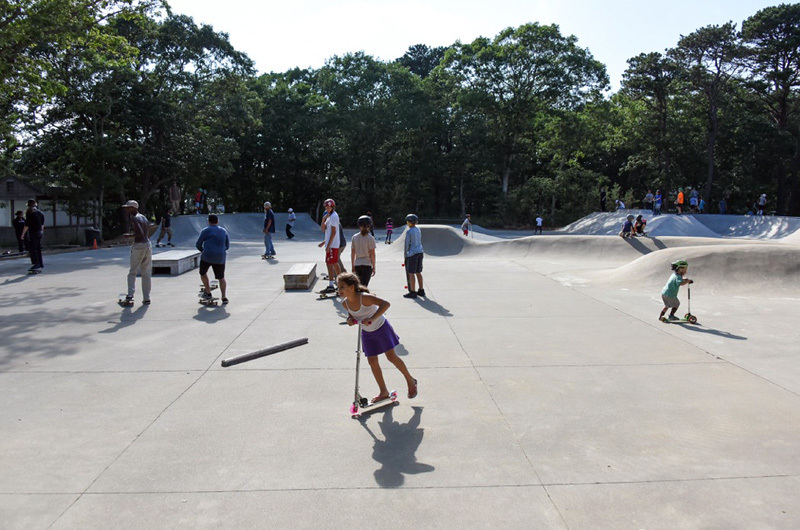 At the Martha’s Vineyard Skatepark’s re-opening celebration on Saturday, all ages were invited to hit the newly renovated park with any style they wanted. And all ages did come. Veteran skateboarders popped gracefully into the air, while young children glided across the ground, some pushed on three-wheeled scooters. The park hummed with urethane wheels racing on concrete and the clatter of decks hitting coping. Mr. Briggs, a member of the original group who envisioned the park 14 years ago, adjusted ramps around the park, positioning them for maximum shredability. Richard Hammond, another member of the original group who now sits on the board, enjoyed a taco from the The Food Truck. “My son first came to me back then looking for a safe space to skate,” Mr. Hammond said, pointing to an adult in a baseball hat. “That’s him.” Mr. Hammond’s son is 23 now. Mr. Briggs, Mr. Hammond and others organized a nonprofit in 2002 called Martha’s Vineyard Skatepark to help get the park built. After a Intermunicipal Agreement between all of the Island’s towns, the regional high school agreed to donate a patch of land across the street from the school. The town of Oak Bluffs agreed to insure and help oversee the park. Then, the group got to work. A mixture of cement and wooden ramps were installed. But the skate world has changed, explained Mr. Briggs. Back then, the industry standard mandated that parks include wooden ramps and surfaces coated with a substance called Skatelite. However, both materials proved difficult and expensive to maintain. “The price of Skatelite has doubled since we first started,” Mr. Briggs said. The wooden surfaces grew uneven. The organization applied for a grant from MVYouth to replace the outdated features with smooth concrete, but was turned down at first. “They told us to apply again because they liked our idea,” said Mr. Briggs. They did, and in 2016 the group received a grant for $252,000. On Saturday, the newly renovated skate park opened and showcased the improvements to the community. “It’s also a thank you to MVYouth,” Mr. Briggs said. Gratitude was abundant all around. Iris and Bob Stein sat in beach chairs and watched the action. “Our grandkids love it,” Ms. Stein said as Kate, 11, and William, 12, dipped in and out of sight. The Steins had been visiting the park on their summer vacations for the past three years. Many people credited the park with giving kids a free, accessible outdoor activity. Ms. Stein said it also helped her grandchildren get to know Island kids, one of their favorite parts about the park. By mid-afternoon, the haze had burned off and the sun was hot. Reggae beats flowed and the interest in free tacos remained predictably constant. The Food Truck, run by Josh and Angela Aronie, gave the organization a large discount in order to feed the skaters, and Island Water Source donated drinks. Sage Marcella sat on a bench with her partner Jared Weatherford, bouncing a tow-headed baby on her lap. Ms. Marcella grew up on the Island but flew out with her family this summer from her new home in Portland, Ore. They pointed out their other son Jesper on a halfpipe. “We had to figure out how to bring that scooter on the plane,” Mr. Weatherford said. This feat of TSA compliance involved taking the scooter apart and duct-taping the pieces together. “We almost left it behind but I’m glad we didn’t,” Mr. Weatherford said. 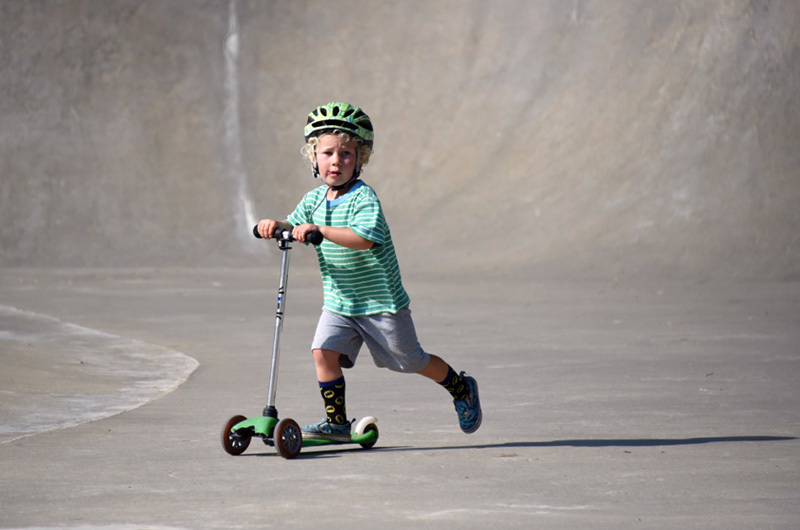 Besides offering a cool place for all ages to intermingle, Martha’s Vineyard Skatepark holds drop-in clinics that run for eight weeks each summer. The program helps children from age seven to 13 improve their skills and offers a chance to meet other skaters. The next part of Mr. Briggs’ plan is to focus on the land around the park. Wild blueberry bushes carpet the surrounding area, but he plans to plant more “so they can cross-pollinate. I’d also like to put in some pear trees,” he said. Mr. Briggs sees the park as a community meetingplace, a safe spot for kids to exercise. Having edible plants around the perimeter would further the goal of providing the Island with a healthy place to hang out. “Anything that gets kids outside and keeps them active,” he said.